On-line gallery of digital artists Jaysin and Embrio. Our webcomics have two different formats that depend on the size of your screen. For larger screens (desktop or sometimes tablet) we present a motion comic with animation. 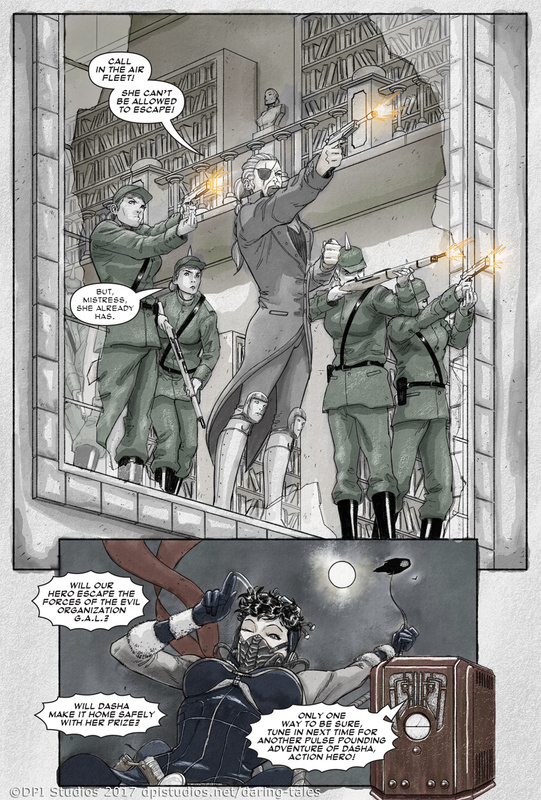 For smaller (mobile) screens we present just the finished comic page as a jpeg that you can zoom into. If you would like to change the default, you can choose which format you would prefer to be shown on this device by checking one of the following checkboxes. Refresh the page after making your alternate choice. If you would like to change the default scale of the comic, you can zoom in or out with the buttons below. Thank you for reading our first Steampunk short story featuring Dasha. We’d love to hear what you thought in the comments. We’re already at work on our next story featuring Lady Ravendale. © 2017 DPI Studios. All Rights Reserved.